Do you love instant and immediate results? Me too! That’s why it’s been so exciting to refresh my living room and give it a Quick and Easy Makeover with Ikea textiles! I’m thrilled to be collaborating with IKEA on this fun project to demonstrate how simple it is to give a room a whole new look… that’s quick to pull together! Using Ikea textiles including throws, pillow covers and Ikea fabric this is my living room’s brand new look! I’m honestly in love with my new room! Here is my living room prior to the Ikea quick and easy makeover! After: Textiles definitely add a finishing layer to a room! Let’s rewind a bit and take a look at how our living room started out….Here is a picture of our living before we moved in – yellow paint, no curtains and a brown stained wood fireplace. 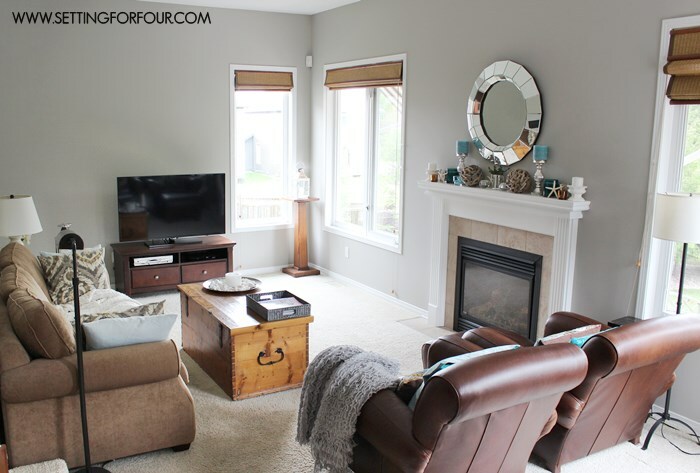 We painted the walls a gorgeous shade of light grey, created a focal point in the room with the large mirror, painted the fireplace white and arranged our seating for better TV viewing. With the IKEA textiles I was able to add a beautiful layer of softness, pattern and color to our room! As I mentioned in my Living Room Design Plan and Mood Board post, my living room really hasn’t changed much since we moved in two years ago. 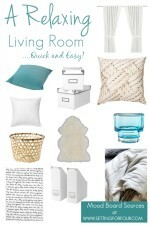 I created a Mood Board for inspiration to see which Ikea textiles would look best with my sofa and leather club chairs. (I love making mood boards! They really are helpful as a decorating guide for any space!). I wanted my living room to have a relaxed, comfortable and coastal feel since my family loves the beach! I had so much fun shopping at IKEA for my Mood Board selections. Wow, I have to say, IKEA has lots of gorgeous textiles and decor for summer in the stores right now! Have you seen their latest lines? Lots of nautical inspiration and fun colors are on the shelves now! Then I came home and had tons of fun decorating my living room and had the room completed in no time at all! 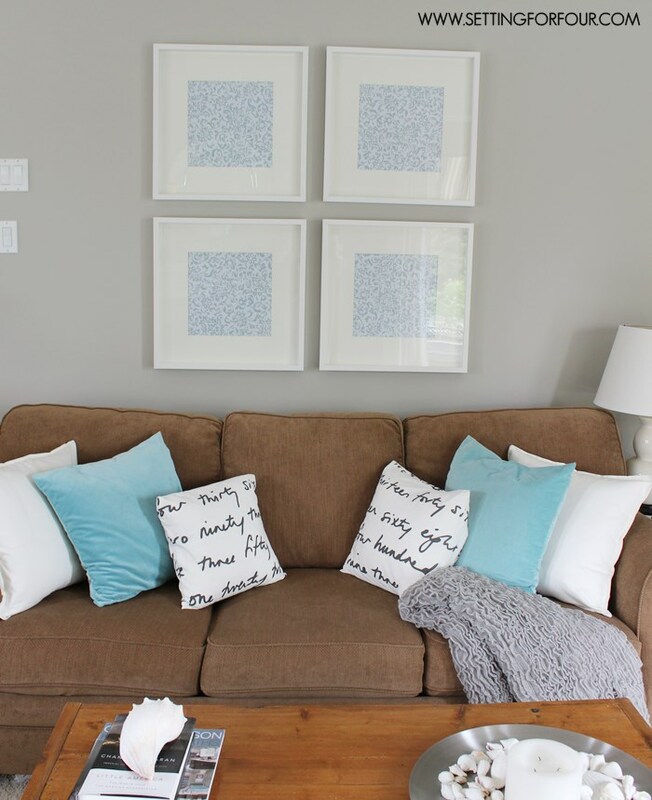 Here are my Quick and Easy living room updates using IKEA textiles! I hung these Ritva White Curtains on my windows. I love these soft flowy white curtains and how they frame out the windows! They pick up the white in my fireplace molding too. These curtain panels conveniently have built-in tabs at the back so I just threaded them onto the rods and hung them!! So easy! 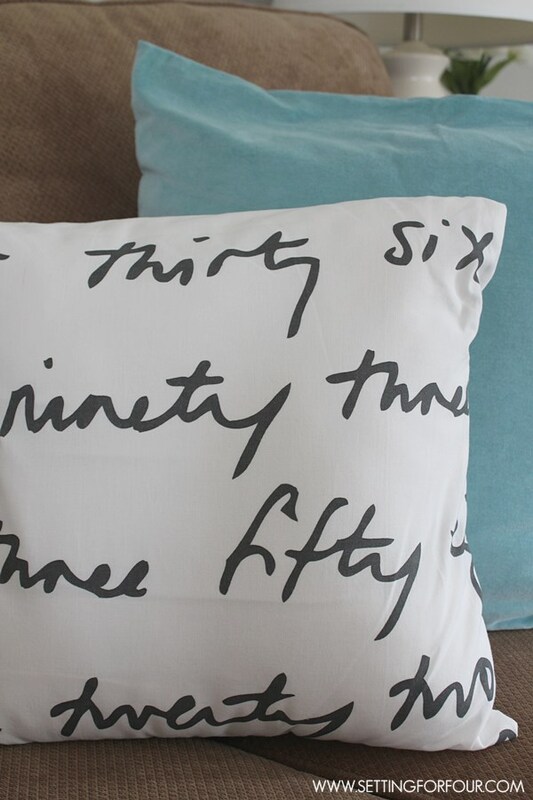 To give my tan sofa a perk-up I added these beautiful blue Sanela Cushion Covers, and white GURLI Cushion Covers to a few pillows on my sofa and made up two easy Five minute pillow covers with this pretty grey and white script Britten Nummer Fabric. 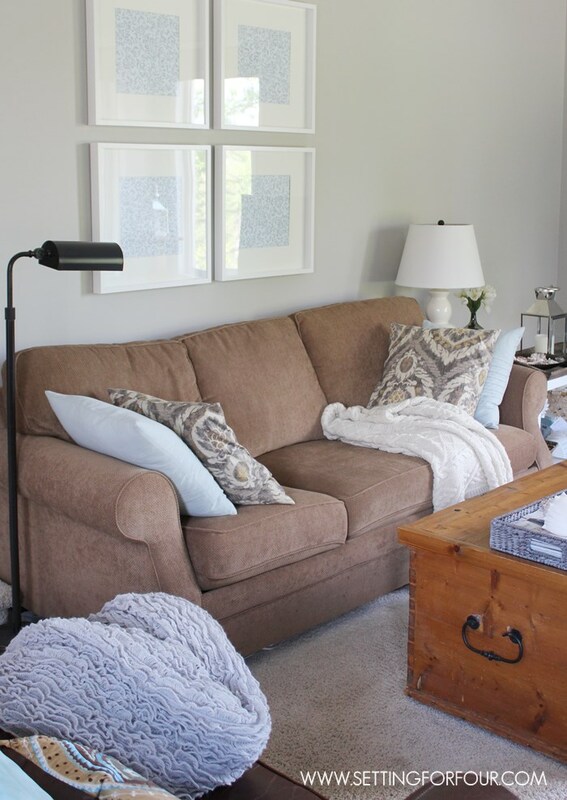 What a huge difference these pillow covers make to my tan sofa and the aqua blue, white and grey colors pick up the other white, grey and blue accents I have in the room. These Sanela Cushion Covers are so comfy…they feel like velvet and are so soft! 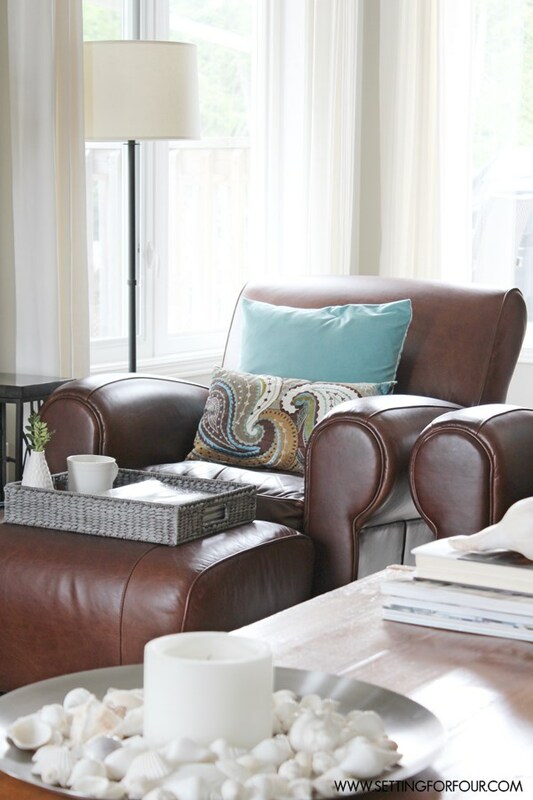 I also added the cushy blue Sanela Cushion Covers to our two leather club chairs…this aqua blue color looks gorgeous paired with brown leather! I mixed them with two brown, blue, cream and tan pillows that I already had and they work fabulous together. Which goes to show you that IKEA textiles can work fabulously with items you already own! Whoa! Love the makeover! While it was super well decorated before, the subtle changes really added some pizzaz! And I am in LOVE with those pillows that look like ropes! The coolest! I adore those IKEA rope pillows too! Aren’t they such a great pop of pattern? 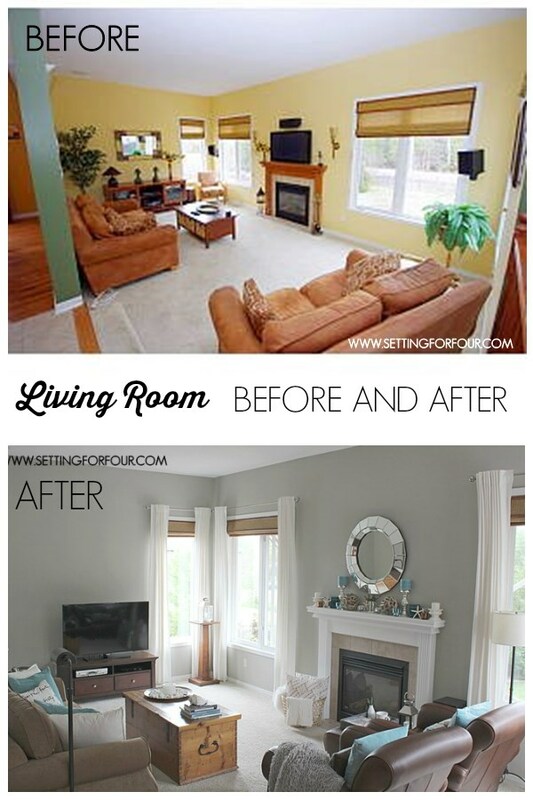 Thanks so much for your comments – I’m so glad you like my living room makeover! I love every inch of it! So many beautiful pieces from Ikea 🙂 I need to go shopping! Thanks so much Debbie for you lovely comments on my living room makeover and I’m glad you love IKEA as much as I do!! Yes – head to IKEA quick to refresh your rooms too!! It’s really nice to be close to an IKEA right now – but like you I used to drive an hour into the city to get my IKEA fix!! I’m glad you love IKEA as much as I do! You are so right the value and style is amazing! I really like the lighting in your living room. So bright! I love the grasses on your bookshelf! Are you forcing the growth (what kind if plant?) or are they faux? Excellent job! Hi Larissa – that’s faux grass!! Requires no watering – lol!!! I’m glad you like my makeover! I love Ikea! It’s perfect for beautiful and seasonal accessories. Your room is lovely! I’m glad to hear you love IKEA too Leanne!!! Thanks for your compliments on my makeover – we are really enjoying it! Love it all but most especially that basket full of pillow and that cable knit throw. Yum! Being in Oregon, even in Summertime, you need the snugglies close at hand 😉 It looks so pretty with all the pops of white and aqua. Wonderful!! Some summer nights it gets cool here too Shannon!! Thanks for your sweet remarks!!! So beautiful Heather! Looks all fluffed and ready for summer! After the wild winter we had I hope we have a long hot summer this year! Thanks for your lovely comments Maryann!! Wow, that is gorgeous! I absolutely love the cable knit throw – and the blue, of course! I love your color scheme! It looks so clean and fresh, and I like how the light textiles balance out the dark leather furniture. Thanks Gina!! I do love to add contrast in a room with color to add interest! I’m so glad you like my color scheme! I’m so glad you like my IKEA makeover!! I’d love to decorate for you! I offer mood board designs and decor help via email or skype – email me if you are interested!! Your living room looks great and I love the Ikea textiles!! I’ve been eyeing those cable knit pillows too and thought that they would look good in a summer living room and a winter one as well – perfect!! The script ones look beautiful too, I have to check that out (wouldn’t it make for great curtains??) Thanks Heather! Love the pops of turquoise. It brings the room to life! Another great update. I love having a neutral decor base that can take simple accessory updates. So nice to see a dash of color too. I agree Maggie – starting with a neutral base lets us have fun with adding different colors for the seasons! LOVE the pop of the turquoise! It goes so well with the brown. The new curtains look fab too!! So lovely! I love how bright you made the space feel. Love the colors you chose. Wow, love the fresh new look! It’s amazing what a few clever touches can do to update the whole room. I love Ikea textiles – I always seem to find something I “need” when I go there! I’m glad you like the changes Dani! I’m like you – I always find fun and lovely things at Ikea! So pretty. You definitely have achieved a coastal look. I love blue with brown leather too, and those curtains add such a nice crispness to the room. LOVE Ikea & their pillow selection. The possibilities are truly endless! I’m loving this color scheme! Gorgeous and such a transformation! I love the cool, beachy blue that you added, Heather. Such a big impact. Gotta love me some IKEA! Exactly! IKEA rocks for making a big impact to any space! Love the pops of color! It look fantastic! I love adding these types of pops of color to a neutral background! Being from the east coast, a coastal theme is one of my favourites. Great job! What a fresh room makeover! I love the pops of colour and all of your throw pillows!! So pretty! I’m popping the blue this summer Jo-Anna! Ikea has the best textiles! Love how you put it all together. Thanks Sarah – Glad to know you have some Ikea textile love too! I’d love to Kara!! 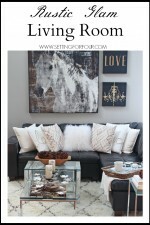 I love helping others decorate their homes! Love the number fabric! And what a transformation the covers made on the throw pillows! I love the clean crisp feel of the whites and blues- such a relaxing feel. Gorgeous room! Hi Barbara! I’m glad you like my neutral and beachside blue color scheme!! Go to IKEA and spiff up your living room – you’ll really love the changes! Heather, please come to Seattle and help me with my living room! We have an IKEA here too! I’m on my way over to help you Malia!!!! I’m glad you have an IKEA near you to shop at! I love how you lightened everything up. Great ideas! Thanks for sharing! You’re welcome Kathy! Such thoughtful compliments – thankyou!!! The updates make the room look so cozy! I am loving the pillows in the basket by the fireplace! Absolutely love the aqua accents and the room looks just amazing! I’m pinning! I’m working on that for the fall Terri! I hope soon to help others out online to decorate their space! Thanks for your sweet comments! I have to admit I thought the before living room was OK but with the IKEA textiles the new look is fabulous! You certainly have a great sense of decor style and colour! You are so sweet to say that Thea!! Our living room is so comfy and cozy now with these Ikea textiles! Love the neutral tones and the splashes of blue and turquoise. I definitely agree that fabrics are a quick, easy way to change things up. Are you planning to hang anything on the wall over the TV set? Wynn – oh yes!!!! THe TV wall needs some major love!! The blank space is driving me nuts! I’d love to add some built in’s to incorporate the TV and add shelving for storage! In the fall I hope to be able to work on that! I know right???? Drapes make a HUGE difference and these IKEA drapes are so budget friendly… and add a layer of wonderful texture and color to a room!! Thanks Meredith!! 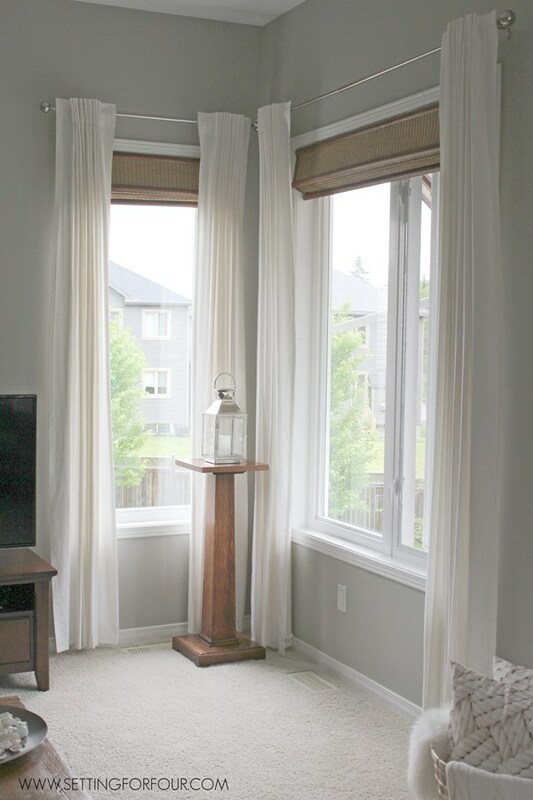 There are blackout liners you can buy that clip into existing curtains…no sew and easy!! That would work really well with your bedroom lighting concerns! I love the mood board. I don’t know why I’ve never tried it. 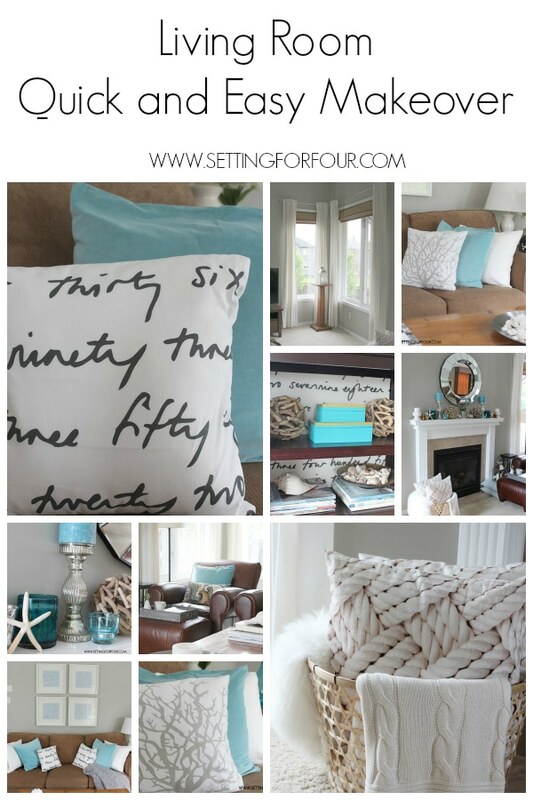 Love the pop of turquoise and the script pillow. Ikea here I come. I’m so thrilled you love my mood board Vicki and yay – so glad you are heading to IKEA to primp your home! I love the elements, especially the cable pillows – those are incredible! Your whole space is beautiful, calm and inviting!! Thanks so much Sheila!! Those compliments coming from you really mean a lot to me!! The cable pillows from Ikea are gorgeous aren’t they? We hang out in our living room all of the time and yes those curtains really make the space feel so comfortable and cozy! Love the light and airy colors, and those drapes soften the room just a bit while still looking fresh! Love this! I am doing a beach themed guest room but I want to keep it luxurious and contemporary feeling. This is totally my style. This would be such a beautiful look in a guest bedroom! I’m glad you found some inspiration here and thanks so much for your sweet comments! I love the colors of your living room. I’m in the process of changing out our living room too and this gives me so much inspiration. Thank you. Oh great – I’m so glad you’ve found some ideas to use in your own home!! Isn’t it amazing the difference drapes and textiles can make to a room? Thanks Desiree! 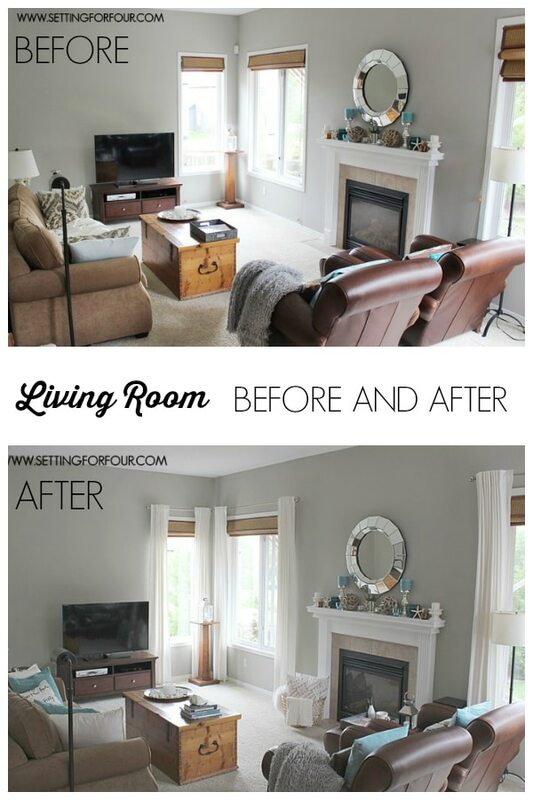 I’m so glad you like my living room makeover – we are really enjoying it! Absolutely gorgeous, love the color scheme! 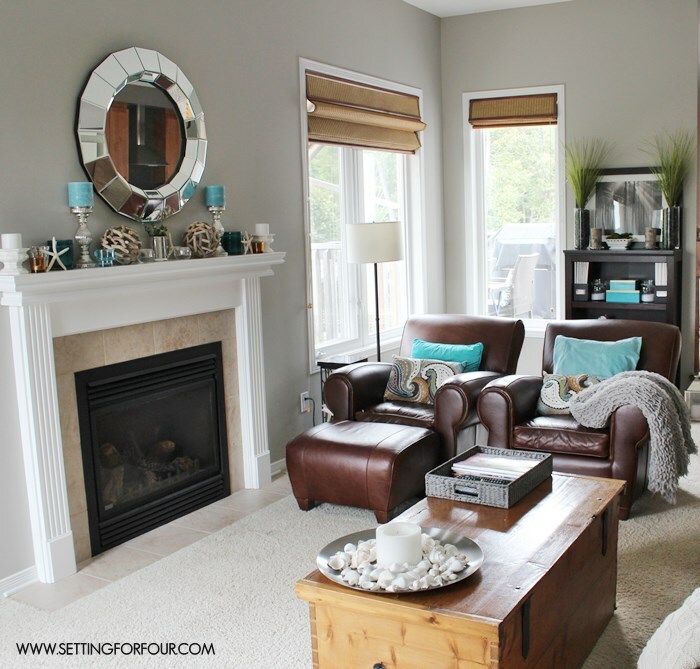 What paint brand/color did you use for the living room walls? Hi Serena! Thanks for your lovely comments! My paint color is Sherwin Williams Mindful Grey…it’s sooooo gorgeous! It’s a warm grey so it never looks ‘cold’ and is a beautiful neutral that goes well with every other color! Love everything about your living room. All my favorite colors in one space. By the way, what brand of paint & shade of graybdid you use on the walls? Hi Marilee – thanks so much for visiting and your lovely comments! 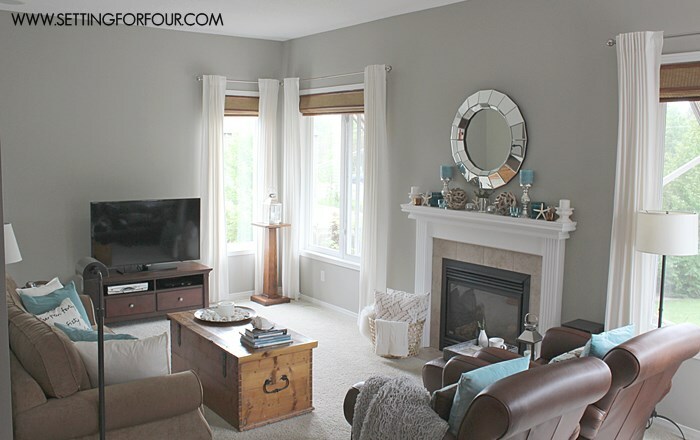 The paint color is Sherwin Williams Mindful Gray – it’s gorgeous!